Just realized - they changed Rob's Edward jacket! Dang it, I loved the one in Twilight. It was so supremely vegetarian vampire (i.e., nobody else would be caught dead in it). I have to say...I really like the lighting change! I thought the Blue washed out one got VERY annoying as you watch Twilight! I'm very excited for this movie! Seems like all the changes have been GOOD! For me this is good in some ways but bad in others. It's a good thing because it won't be as cold and everyone be quite as pale, but look at the flowers in the background. In the blue tint you can clearly see the brightly colored flowers but in the golden tint they're not as noticable. Of course they might just be trying not to attract attention to smaller details and making you focus on the characters or main events. Just one more note. 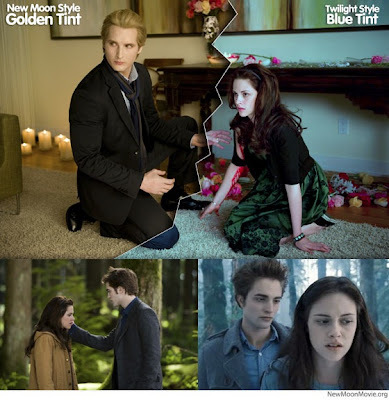 Did anyone notice that in the top picture Bella is paler than Carlisle? I found that funny, but that may be my weird sense of humor. ♦Z~Z♦ Bella is only paler in the top picture because of the lighting... that's what they are trying to show. I like all the changes for New Moon so far... I could not stand the blue lighting of Twilight and was very pleased with the New Moon trailer! And Peacey, I agree with you about Edwards coat... I like the old one better, but this new one is starting to grow on me! LOL...if that's the only "negative" thing we can find about the movie so far... I think they are doing good!